Joseph Bellows Gallery is pleased to announce its upcoming solo exhibition, Bevan Davies - New York. The exhibition opens on March 14th and will continue through May 9, 2015. An opening reception will be held on Saturday, March 14th, from 6 – 8 pm. New York will present Davies’ luminous and highly detailed large-format black and white architectural views from the mid 1970’s, along with a selection of his earlier street portraiture from the preceding decade in the atrium gallery. This change in subject and approach resulted in Davies most celebrated work. Created in 1975/76, Bevan Davies’ architectural photographs situated themselves wholly within the dictum laid forth by William Jenkins, as “New Topographics”. In fact, Davies writes of his approach as, “an effort being made to let the camera almost see by itself”. This notion was carried further by the late photographer, Lewis Baltz, who in 1976, referred to Davies’ photographs as, “rigorously contemporary, while acknowledging a use of the camera which dates from the inception of the medium”. 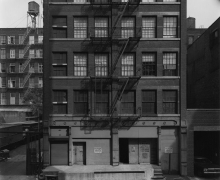 The New York facades, taken in the early morning hours and devoid of people, describe spaces defined by light and shadow. 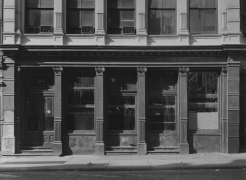 They depict a specific time and place, as seen by the window dressings and signage, as well as portray a formal grace among the building's details that are included within Davies’ camera frame. New York is the first comprehensive exhibition of Davies’ photographs in over two decades. Davies' photographs can be found in the collections of the J. Paul Getty Museum, Center for Creative Photography, Art Institute of Chicago, Nelson-Atkins Museum, Minneapolis Institute of the Arts, Museum of Fine Arts, Houston, George Eastman House, Corcoran Gallery of Art, Harry Ransom Center, Metropolitan Museum of Art, and the International Center of Photography. In 2014, Nazraeli Press released Los Angeles, 1976, a monograph on Davies’ photographs from that region and era. 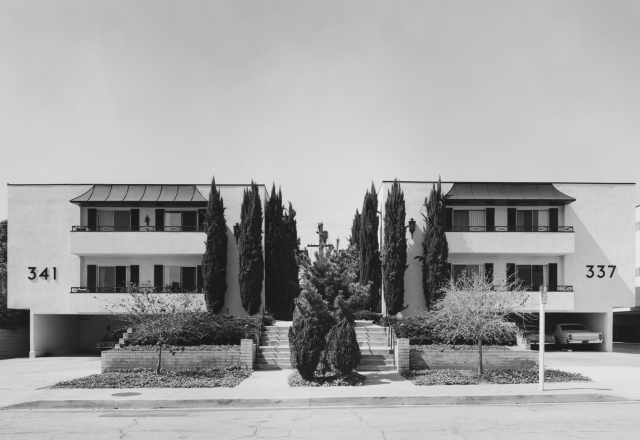 The photographs depict the residential architecture and neighborhoods through nuanced arrangement and clarity. 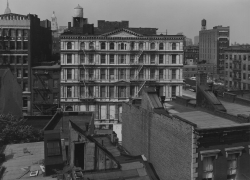 A forthcoming volume on Davies’ New York photographs is in prepublication.